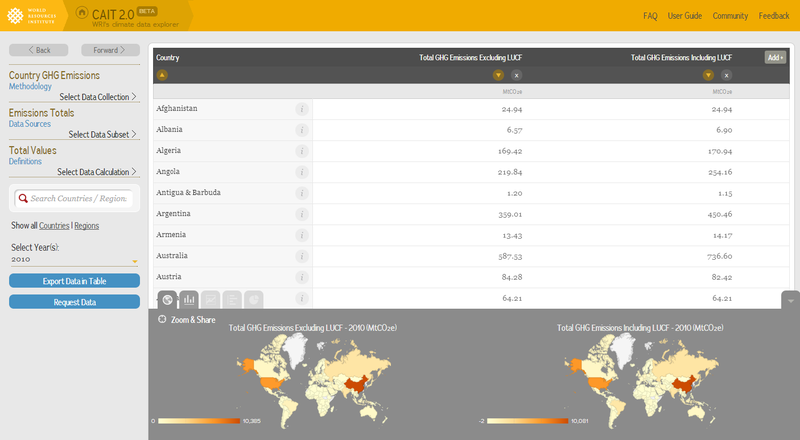 CAIT Climate Data Explorer (CAIT), WRI’s interactive climate data platform, provides free access to comprehensive, reliable, and comparable greenhouse gas emissions data sets. It also provides other climate-relevant and socio-economic data, to enable analysis on a wide range of climate-related data questions. Through its powerful yet simple and easy-to-use online interface, CAIT is designed to help users from government, business, academia, the media, and civil society efficiently explore, understand, and communicate climate data. CAIT's primary purpose is to provide accessible, transparent, high-quality information to support the many dimensions of climate change policymaking. The original CAIT (online from December 2003 – May 2012) was frequently cited in news articles, policy briefs, and government documents, and was regularly used to inform policy discussions within the United Nations Framework Convention on Climate Change and other forums – affirming its status as one of the most trusted sources of policy-relevant climate data. Since then, we have deployed multiple updates on the tool, building on the strengths of the original CAIT while taking advantage of advances in online technology to provide a more streamlined, intuitive, and user-friendly experience.